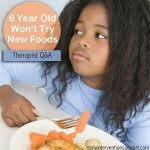 Home Most Recent Early Intervention Articles Picky Eaters vs. Problem Feeders – Do You Know the Difference? Picky Eaters vs. Problem Feeders – Do You Know the Difference? Unlike picky eating, problem feeding is not a normal part of child development. Children who are problem feeders often have inadequate caloric intake, poor weight gain and growth, as well as vitamin and mineral deficiencies. If left untreated, children who are problem feeders can suffer from malnutrition, dehydration, and impaired intellectual, emotional and academic development. The incidence of feeding disorders in typically developing children has been reported as 6-40%, while the incidence of feeding disorders in children with disabilities has been reported to be much higher at 18-80% (Kyong-Mee Chung, Sung Woo Khang, 2006). Prolonged, untreated feeding disorders can also result in the disruption of positive mealtime routines, which can lead to a disruption in parent-child interactions where less cuddling and positive interactions occur (Budd, et al 1992). Problem feeders will often need extensive therapy from a multi-disciplinary feeding team (occupational therapist, speech therapist, nutritionist, psychologist/behavioralist, physician) of which the parents are an integral part, in order to overcome their feeding problems. Studies have shown that treatment success and gains at home were largely due to parental compliance in implementing and following through with clinicians suggestions and protocols for treatment (Kennedy Krieger Institute). Most picky eaters get enough calories per day to maintain healthy weight and growth. Picky eaters can be managed at home without too much difficulty. The majority of picky eaters will gradually expand their diet to include a greater variety of foods if these suggestions are implemented. Do You Think My Child Has ADHD (Attention Deficit Hyperactivity Disorder)? What Are the Warning Signs of Autism, and Why Should ALL Parents Be Aware of Them? How Does My Parental Screen Time Impact My Child’s Development? Toddler Nutrition: Just How Much Should a Young Toddler Eat? © 2009-2014 Thrive Place, LP.